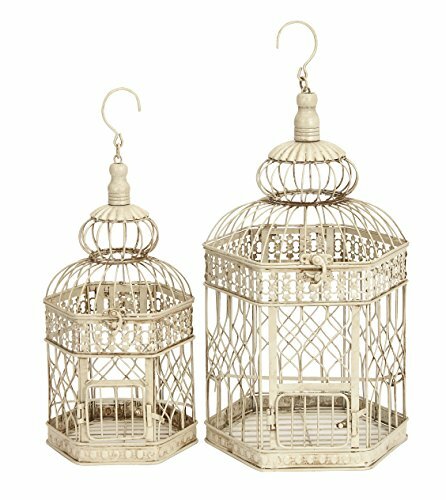 Our beautiful set of 2 decorative bird cages for indoor and outdoors. Great for wedding reception ceremony, bachelorette party, gift card box holder, hanging herd gardens, photo booth props. 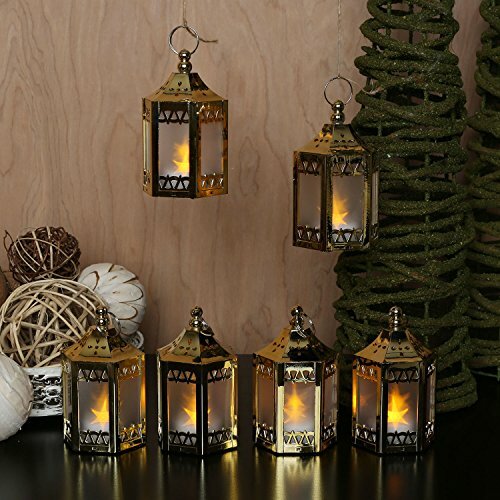 They are really romance and pure elegance!Also suitable for children or adults parties, centerpiece at home or business, with real or fake flowers, candles, artificial birds or potted plants. They compliment reception tables as home or garden decor. Make your special day truly personal and unique by adding colors, flowers, and ribbons.Features:Size: Big one - 24cm(H) x 15cm(D) / 9.45" x 5.91", Small one - 19cm(H) x 12cm(D) / 7.48" x 4.72".Material: MetalColor: GoldNote: With the difference in measurement method, please allow 0.1-1 inches in size and weight deviation. Due to differences between monitor displays, actual color may vary slightly from image. 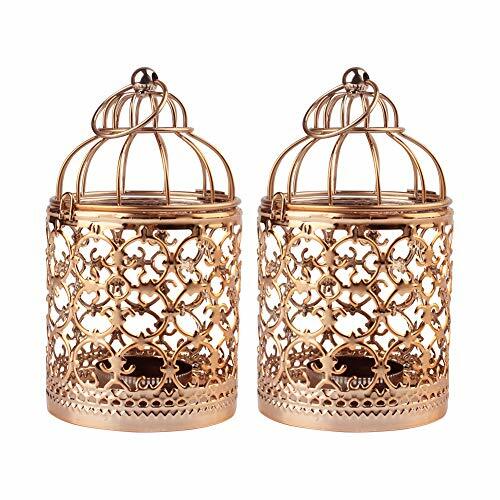 A lovely decorative metal bird cage in gold-colored metal perfect for rustic theme occasion. Featuring a detailed cluster grapes design, flat base, 2 inch metal hanger loop and opening top with hinged lock. Can be use as hanging decor or table centerpiece for wedding, sweet 16, quinceanera and other special events. 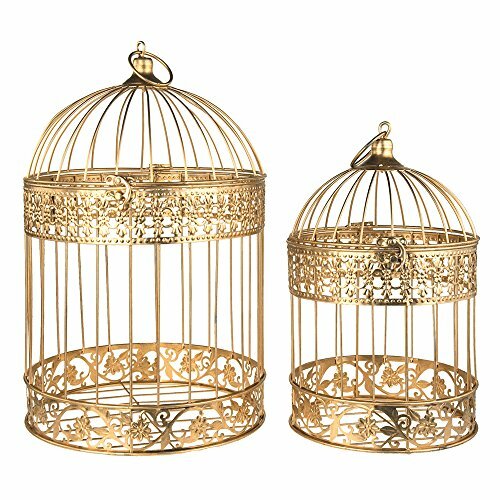 Our beautiful set of decorative bird cages are for indoor and outdoors. Perfect for wedding reception ceremony, bachelorette party, gift card box holder, hanging herd gardens, photo booth props, dessert table holder. Also suitable for children or adults parties, centerpiece at home or business, with real or fake flowers, candles, artificial birds or potted plants. They compliment reception tables as home or garden decor. Make your special day truly personal and unique by adding colors, flowers, and ribbons. 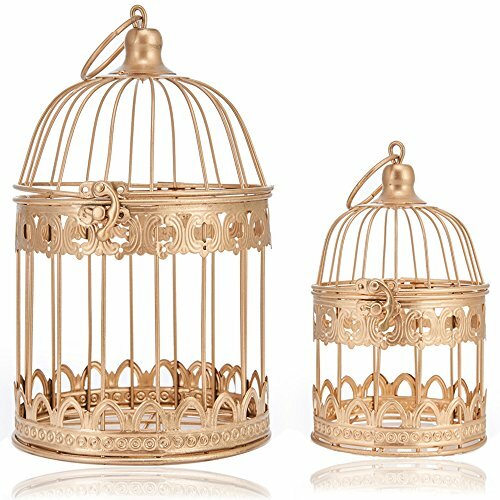 Add an ethereal touch to your wedding decor or party ambiance with our glinting gold polished metallic bird cage decoration. Embellished with a detailed floral vines design, a gold metal hanger loop and opening top with a hinged lock, this glam piece will make the beholders redefine their perception of a traditional birdcage. They look gorgeous as independent decor elements and also to complement other decoration details. Whether you are planning a vintage styled, glamorous, or even rustic themed weddings, incorporate these bedazzling birdcages with your already chic decor to create an enticing spectacle to behold. 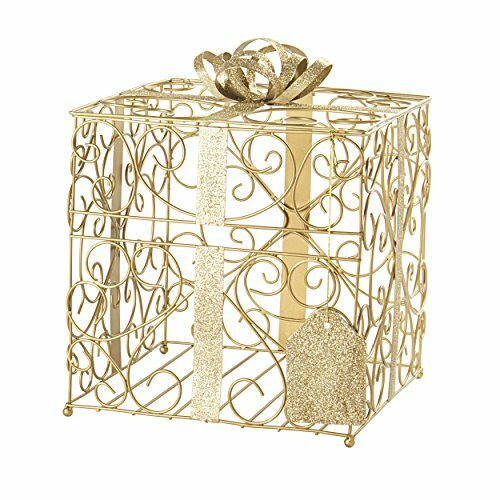 Perfect for Centerpieces or as a classy alternative to Wishing Well, Honeymoon Fund Box, Place Card Holders, or even Guest Book substitute. For a truly exotic appeal, place our Silk Flowers or Foliage, Candles, or LED lights inside and decorate with pearl or rhinestone strings or floral garlands and place atop our Decorative Mirrors or Chandelier Centerpiece Risers. 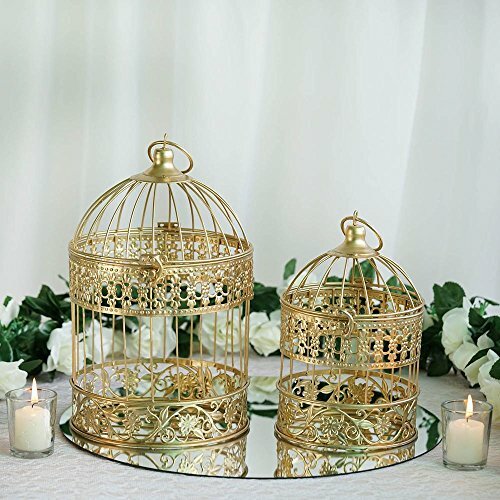 If you're planning an outdoor wedding, these gold Bird Cages will look stunning while hanging from your trees, placed next to your wedding outdoor sign, or as enchanting aisle decor details. Are You Reception-Ready?Keep your gift table looking organized and fabulous with a Cathy’s Concepts Reception Gift Card Holder. A perfect compliment to any and all reception celebrations, this eye-catching container has become a bestseller among brides everywhere.Constructed from ornately shaped, high-quality, contoured metal, Cathy’s Concepts cardholders are guaranteed to look their best not only for your Big Day, but for all of life's big celebrations to come.Every box features stunning glitter accents, a decorative bow, a front card slot, a glitter gift tag, a cardboard insert and an easy-to-remove lid.When it comes to your Big Day, it’s the little details that matter most. Add the finishing touches to your reception and order your Cathy's Concepts Reception Gift Card Holder today!About Cathy's ConceptsCathy's Concepts has been a leading manufacturer and direct shipper of wedding accessories and personalized gifts since 1988.We offer a complete in-house design, photography and marketing department that allows us to create truly personalized, high-quality products for all of our customers. Set of two 22 inch and 18 inch French country inspired distressed ivory finish iron hexagonal double domed hanging and standing birdcages, geometric caging with door and latch openings, hangers and banded flat bottom bases with beading. Suitable to use as a decorative item. Best for both indoor and outdoor use. This product is manufactured in China. Decorative Tall Metal Gold Bird Cage, Length 31"
2 PIECE SET Handmade Ivory Bird Cage Skirt & Gold Cheetah Cover Fits up to 60"